A Practical Guide to Dermal Filler Procedures is the second book in the newCosmetic Proceduresseries especially designed for providers who would like to expand their practice to include minimally invasive cosmetic procedures. Residents or practitioners new to aesthetics and experienced providers alike can benefit from this series which focuses on current aesthetic treatments that can be readily incorporated into office practice. For the “hands on”providers, these commonly performed cosmetic procedures can make the practice of medicine more rewarding, improve patient satisfaction and increase reimbursement. 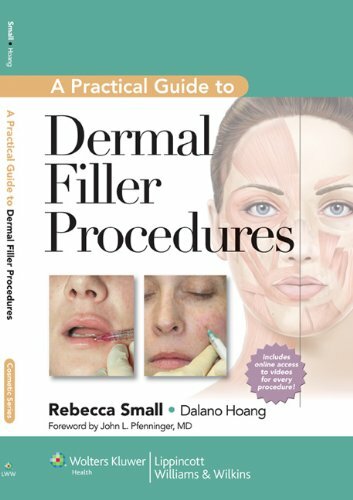 This book provides thoroughly illustrated step-by-step instructions on dermal filler treatments and advice on managing common issues seen in follow up visits. Each chapter focuses on a single dermal filler procedure and reviews all relevant anatomy including target regions and areas to avoid. Injection sites are highlighted to help practitioners perform the procedures more effectively and minimize complication risks.The series foreword has be written by world renowned author, John. L. Pfenninger. Access to a companion website, http://solution.lww.com/practicalguidefillers is also included with video clips of every procedure!